Nangol: The Origin of Bungee Jumping? In the southern part of Pentecost Island in Vanuatu, April marks the beginning of the yam harvest season. Each year from April through June, the people of Pentecost Island harvest this important crop that provides both sustenance and a good for trade. To ensure they enjoy a bountiful crop, villagers engage in one of the world’s most remarkable feats – land diving. Land diving (known in the local Sa language as Gol and in Bislama as Nangol) is a ritual that dates back hundreds of years. The ancient precursor to bungee jumping, land diving is a sacred ritual villagers perform each year that requires men to jump from the top of a tall platform with nothing but solid ground below. Villagers construct a wooden tower that stands between 20 to 30 meters (66 to 98 ft.) in height in the middle of a jungle clearing. Between 10 to 20 men per village will climb the tower and tie vines around their ankles before jumping high into the air. If all goes as planned, the vines will snap taut just in time to prevent the diver from hitting the ground, allowing him to swing close enough so that his shoulders barely brush the soft mud below. 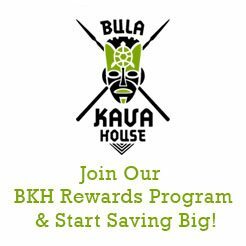 Bula Kava House’s own Judd Rench was able to watch this remarkable feat in person during a 2012 trip to the island nation. 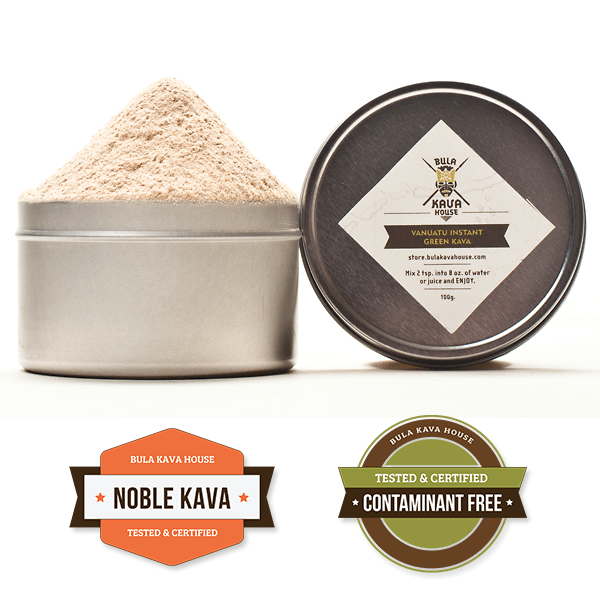 An exceptional blend of kavas from a variety of Vanuatu islands, Nangol Noble kava offers a wonderfully euphoric effect that perfectly captures the spirit of the land diving tradition. Legend tells a story that hundreds of years ago a young woman began arguing with her husband, Tamalie. When the argument turned heated, the woman ran from Tamalie, seeking safety in the lush jungle that surrounded her village. Seeing that her husband had followed in pursuit, the young woman frantically climbed to the top of the tallest tree she could find. But even that could not stop Tamalie from following. As he began making his way to the top of the tree, leaping from branch to branch, the young woman felt an overwhelming sense of dread. Left with no other option, she threw herself from top of the tree, only to see Tamalie jump right behind her. Tamalie plummeted to his death. But the young woman was not so foolish as to plummet from her perch unprepared. Before jumping, she has tied vines around her ankles, which broke her fall moments before crashing to the earth, saving her life. Santari Village Nangol — Some ceremony before a youngster goes for his first ever jump in Vanuatu. Local custom now says that land diving first began as a way for the men of a village to prove defiantly that a woman would not so easily fool them, as Tamalie had been so long ago. Today the tradition of land diving has evolved to take on a variety of meanings for the men of Vanuatu. For young boys, land diving marks their transition from childhood into manhood. When a boy feels he is ready to become a man, he will climb to the lowest platform on the tower and make his first jump, as his mother stands proudly watching below. Traditionally, the mother will clutch in her hand some small piece of her son’s childhood, a favorite toy or scrap of cloth. Once her son has successfully completed his jump, the memento from his childhood is thrown away, symbolically putting to an end his time as a boy and welcoming him into manhood. For village elders, land diving is an annual rite of spring. The villagers believe that a successful jump will guarantee a bountiful yam crop, and the higher each jumper leaps into the air, the more successful a crop the village will enjoy. Villagers also believe land diving can improve a man’s health and strength, and serves as an important demonstration of his bravery. However, men unwilling to jump or who back out at the last moment are not viewed as cowards or weak. Pentecost Island Villagers view both the tower and the land dive itself symbolically as a representation of the body and fertility. A man’s choice to dive is his own. For men who decide to jump, the ritual begins with the least experienced divers jumping from the lowest platform on the tower, and ends with a village’s most experienced divers jumping from the very top. A perfect jump involves the diver landing close enough to the ground that his shoulders graze against the soft, tilled soil below. Before making their jump, divers are allowed to sing, give speeches and make gestures. The night before jumping, divers settle all of their personal affairs in case the jump goes poorly. In order to get his shoulders close to the ground, a diver will cross his arms and tuck his head while in mid-leap. Considering that Guinness World Records ranks the g-force experienced by land divers as the greatest found in the non-industrialized world, this technique leaves the diver vulnerable to suffering severe head, neck, and back injury should the vine break or prove too long. Despite the risk, the people of Vanuatu insist that fatalities rarely, if ever, occur from land diving, though no official statistics are tracked. While most of us would never dream of participating in a land diving ceremony, those villagers brave enough to take the plunge have our respect and gratitude for sharing this incredible tradition with the rest of the world. Here’s to another great harvest.